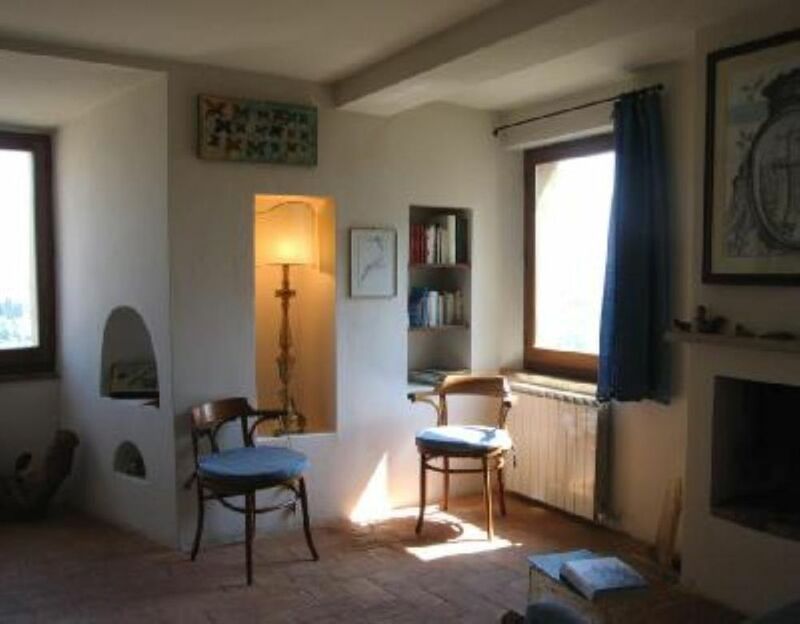 The Torre Cetona house consists in a semicircular tower built in the 14h century along the town walls, and has been refurbished with care and passion. It is on four levels connected by marble stairs and accommodates 6 people in 3 bedrooms (two king-size and one twin-bed). There are two bathrooms, both with shower and bathtub, close to the bedrooms, a guest toilet near the entrance lobby, a laundry room, a lower ground floor cellar, a large kitchen dining room and two living rooms. The ground floor living room has round thick walls that ensure a cool temperature even in the summer, while the bright first floor living room boasts a working fireplace and panoramic views. On the top floor there is a studio with a balcony, enjoying magnificent views over the surrounding countryside, which is also ideal for star watching. There is a well-equipped terrace, well-stocked with flowers, where it is possible to sunbathe and eat al fresco. Amazing, unique rental that personifies ancient and modern Cetona. We visited Italy in June 2015 and spent 4 nights in Cetona staying in this wonderful apartment. Firstly, the owner Massimo was very helpful and communication was prompt and easy by phone or email. The apartment is very close to the central square less than a 2 minute walk away. There is a short steep hill from the town square to the apartment. We are a family of 5 ( 3 young adult children) and the accommodation was comfortable and spacious. It is a charming place and had all we needed including dishwasher, and washing machine and well equipped kitchen. Being a tower there are 3 stories (and stairs). There is an amazing view over the valley from the rooms and patio. We ate at a couple of decent restaurants in the square. There is a nice bakery in the town square and a good supermarket (Co-op) on the main road a couple hundred meters turning left out of the square. We parked in the free parking lot near the school, less than a minute from the town square. Cetona is a lovely little town which allows easy access to the towns of southern Tuscany, and Umbria. We would highly recommend staying in this apartment if you are visiting this area. We enjoyed every minute of our stay in your Cetona tower immensely, relaxed and completely dropped out of time. Plenty of space, quiet and peaceful location, romantic and authentic apartment with all required appliances, unbelievable view from the top floor - who could ask for more? If you want to immerse yourself into magic tuscany atmosphere, slowly walking on the streets of small towns nearby (Montepulciano, Pienza, Cortona), tasting wonderful local wines (Brunello, Vino Nobile), visiting picturesque churches (Orvieto dome is outstanding) this is the place for you. Wonderful apartment, beautifully equipped, with absolutely breathtaking views of the Tuscany landscape. Apartment was located a few minutes walk from the main square (up a short steep hill) with car parking approximately five minutes walk away. Cetona is a small town with several excellent restaurants situated in an ideal area to experience and explore the wonderful Italian lifestyle and surrounding villages. Highly recommend this apartment as it is a very unique and special holiday rental. The owner is very charming and was most helpful, providing lots of information before our arrival. Very quiet medieval village; hardly any traffic in the vicinity of the house. Stunning picture-postcard-views on the valley and village. Proximity of cafés, bars, restaurants (Osteria Vecchia da Nilo, Osteria del Merlo: both high-quality restaurants!) and supermarket. Parking space: not in the immediate vicinity of the house, but hardly a 3-minute walk (parking space behind the village school) away. Just a few minutes to walk from the central square of Cetona to the house. A rather steep climb is rewarded by the stunning views and absolute tranquility once in the house! The owner is a very friendly and helpful guy and fluent in English as well. We can not wait to return to Cetona and to this magnificent tower!" "We spent a week after easter 2012 in La Torre di Cetona apartment. That was a happy and relaxing stay. The apartment is just amazing with it''s wonderful view over Tuscan landscape, cosy and interesting at the same time. Tranquile surroundings and short interconnections to neigbouring areas to visit. The owner, Massimo with his family are most care taking, friendly and attentive masters, thanks to them. I''m happy to recommend this destination to anybody who appreciates Tuscany and it''s friendly hospitableness." The house is located three minutes' walk from the town's main square, shops and restaurants. The town is equidistant between Rome and Florence, and is located 10 km from Chiusi, a mainline railway station from which it is possible to reach Florence in 1 hour and Rome in 1 hour 10 minutes by Eurostar or InterCity trains. Two restaurants in the neighborood, Osteria Vecchia and Spirito di..vino, serve delicious meals from typical cuisine. Several sports activities and trekking can be done in the proximity of the village. Lovers of history and archaeology will be interested in the Belverde archaeological park, whose Palaeolithic finds are kept in Cetona Civic Museum. Despite being a well-established tourist attraction, the town retains an authentic rural character, sober and tranquil.